Grand Center Vice President Michelle Stevens and National Endowment for the Arts Chairman Jane Chu in the Public Media Commons on Olive Street. St. Louis is on the right track, according to the head of the nation’s largest grant-making organization for the arts. Jane Chu, chairman of the National Endowment for the Arts, visited St. Louis Monday as part of a tour of NEA grant recipients. Her stops included the Grand Center Arts District, which has received two “Our Town” awards totaling $125,000 to help with plans to make the area more walkable and attractive. Freezing temperatures and blustery winds made Monday less than ideal for an outdoor stroll. 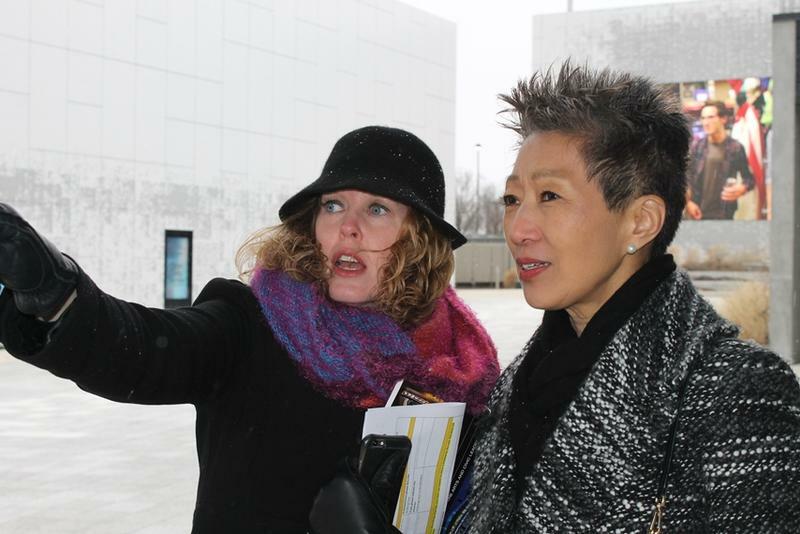 But Chu seemed happy to take in the area with Grand Center’s Michelle Stevens as her tour guide. Stevens pointed out the newer Public Media Commons with its massive video screens, as well as the now-vacant Masonic Temple. Chu noted that neglected buildings in up-and-coming areas like Grand Center tend to benefit from what she calls a “front-porch” effect. “Somebody sweeps their front porch and I say, ‘I think I’ll sweep mine, too.’ And pretty soon there’s a confluence of activity and vitality,” Chu said. 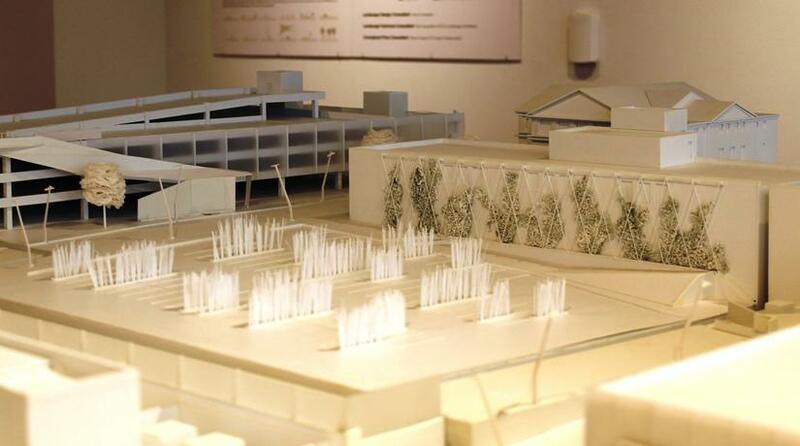 By the end of summer 2016, people making their way around Grand Center should be able to enjoy a climbing garden at The Sheldon, shown in this model. The parking garage on the left side of the photo does not exist but is part of a larger plan. Greening up The Sheldon is the next phase of Grand Center’s plans. This summer, The Sheldon will construct a garden wall across the entire expanse of its west side, visible from the parking lot on Washington Avenue. It's working with the Missouri Botanical Garden to figure out which plants will thrive there. Grand Center has applied for a third NEA grant that will make it easier for pedestrians to walk from Lindell Boulevard to the Public Media Commons. 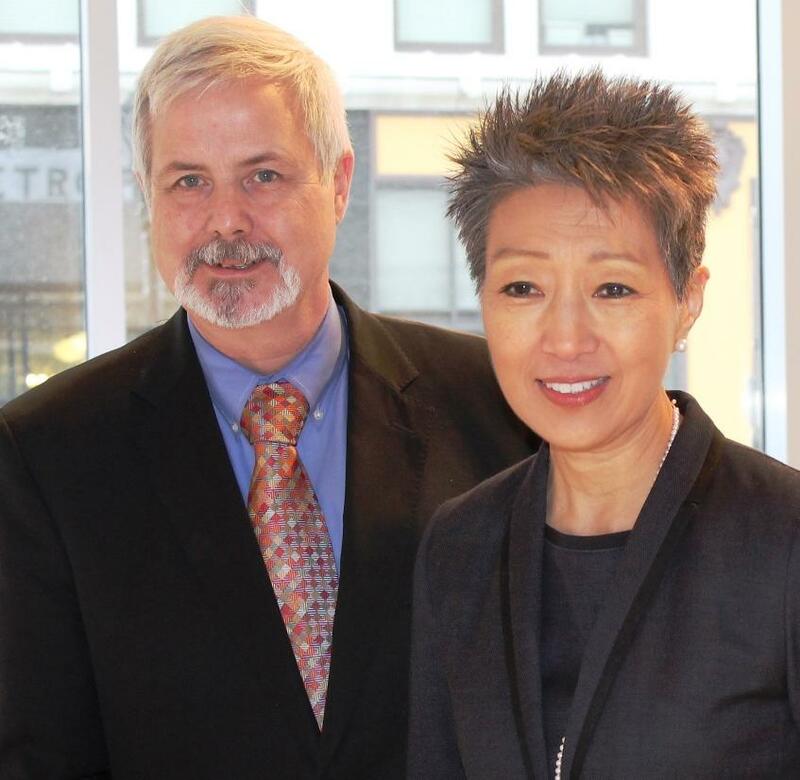 Michael Donovan, head of the Missouri Arts Council with Jane Chu, chairman of the National Endowment for the Arts. Michael Donovan, head of the Missouri Arts Council, said what successful projects have in common are authentic connections and use of natural assets. “What makes St. Louis unique is that we have this large stock of historic housing and buildings that are available, and affordable spaces, open spaces,” Donovan said. Both Donovan and Chu also toured the COCA arts center in University City, which received $40,000 from the NEA this year. Chu applauded COCA’s teachers for using the arts to help push kids to be well-rounded individuals. “They pay so much attention to the conditions that surround the student in addition to their participation in arts: ‘How are you doing school? Are you doing your homework? How are you going to manage your time?’” Chu said. Chu will visit Jefferson City on Wednesday to speak at the Missouri Arts Awards. Both organizations are celebrating their 50th anniversaries. 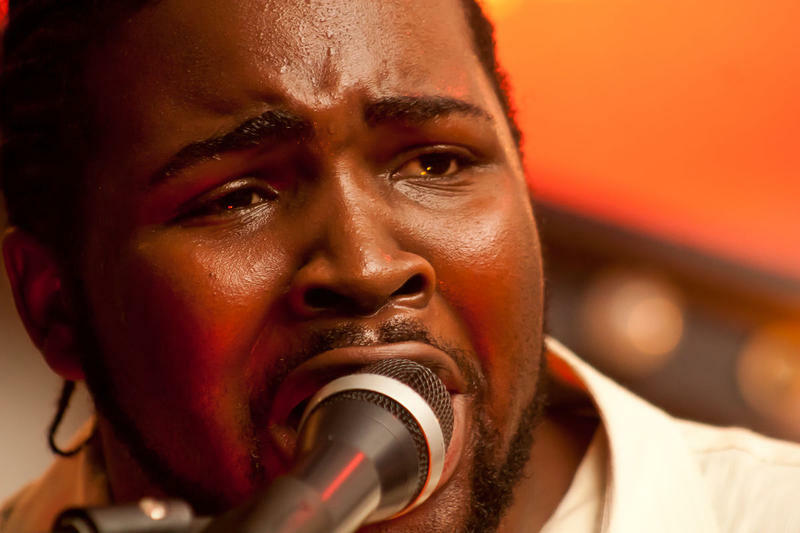 St. Louis Public Radio intern Nathan Rubbelke contributed to this story. 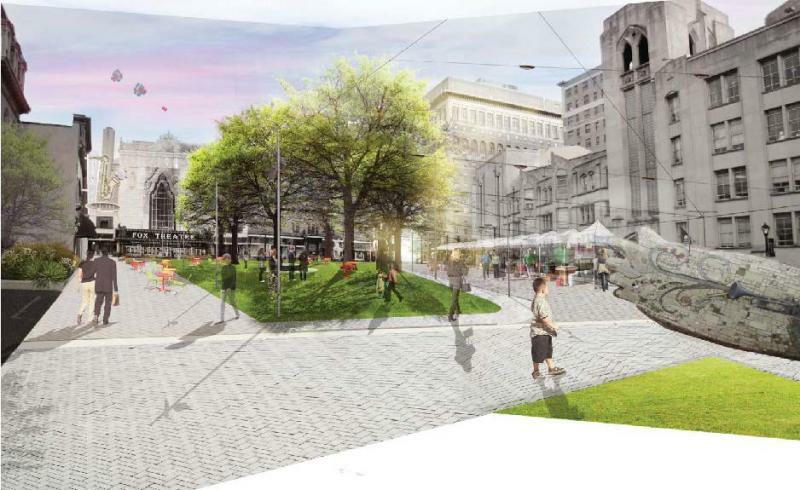 A new $50,000 grant will help make St. Louis’ Grand Center more pedestrian-friendly. The midtown arts and cultural district received the money Wednesday from the National Endowment for the Arts’ “Our Town” grants program. 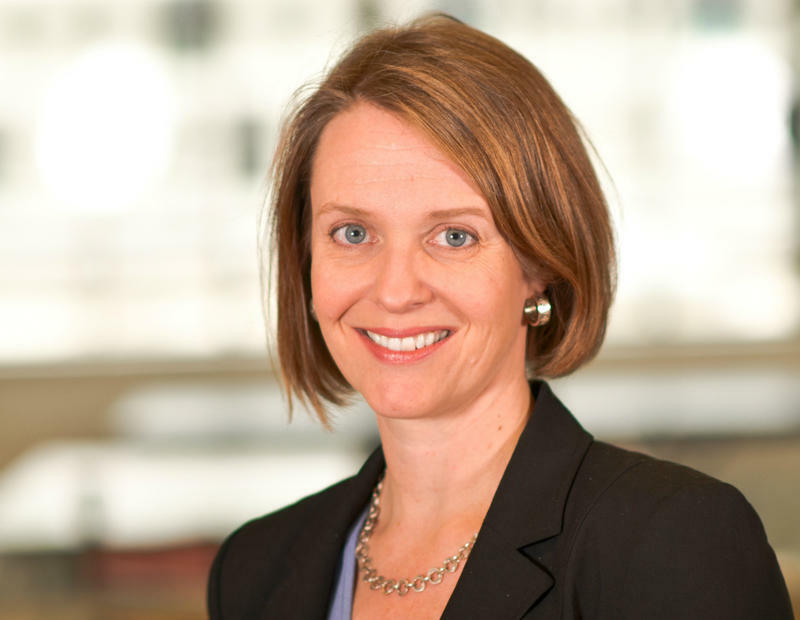 Provided by Grand Center Inc.
Grand Center Inc., which oversees development in the Midtown arts district, will be led by Karin Hagaman starting in mid-September. Currently head of project development at Cortex Innovation Community, Hagaman has experience in planning and executing the large-scale developments there. Grand Center is where you’ll find a variety of bands, beer tents, street art, food and drink specials and more Friday night. This Music @ the Intersection Festival is one night in July, one in August and one in September. And it does not fit the pattern of the events in the Big List below. It has several bands each night in several venues. The Sun Theater in Grand Center has reopened after nearly 40 years of neglect and abandonment. On Grandel Square near Powell Hall and the Fox Theatre, the Sun Theater is being leased by the Grand Center Arts Academy. The Lawrence Group, a St. Louis-based design firm, spent $11.5 million on the theater’s renovation. 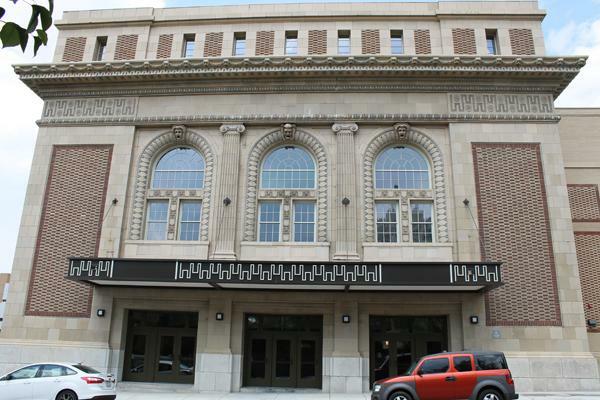 Lynne Glickert, executive director of the Grand Center Arts Academy, said she was always hopeful the school would be able to use the Sun Theater for its 535 students. The school is the Beaux Arts Building, which is next to the Sun.